It can be hard as hell to get quality work done while traveling. You’re totally thrown off your routines. You let your great habits fall prey to living in the moment and enjoying your destination. 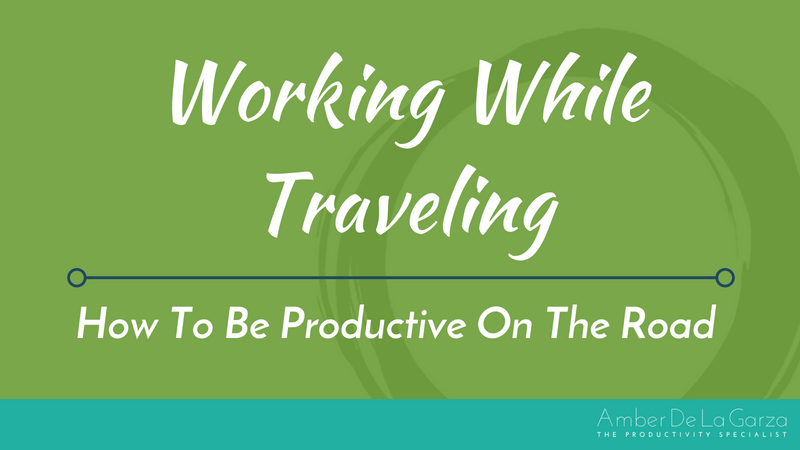 There is definitely a place and time to travel solely for leisure but if you want to be productive while on the road, you need to be proactive. Otherwise, you’ll be nowhere near as productive as if you were in the comfort of your own office. That doesn’t mean you should slave away at your tasks and projects for eight hours a day while in another city. It does mean that when you choose to work, even if only for an hour or two, you should make sure you’re getting great, focused work done instead of wasting your time. As tasks get added to your list, think about when and where the best time to accomplish them is to be most efficient and effective. Perhaps you could reply to emails while waiting for your meetings to begin but need the complete quiet of your hotel room for creating content. Create your plan of attack to complete the tasks on your plate and stick to it. Once you’ve established your plan, clue others into it. When you are on a business trip you are generally in longer meetings than usual and unavailable for extended periods of time. Set reasonable expectations by communicating to others that you are away on a business trip. You can easily achieve this by updating your voicemail greeting and setting up an email auto-reply. State the dates you will not be available and inform them you will return their call or email as soon as you can which will put them at ease knowing you are not missing in action or avoiding them. If you’ve planned a theme day for correspondence, assure them that’s the date you will get back to them. Just make sure you do! You can also tell people via an email auto-reply that if their matter needs immediate attention, they should resend their email with “URGENT” in the subject line so you will know to make their email a priority. Otherwise, let people know who else they can contact for assistance in case of an urgent matter to not let your client service suffer just because you’re traveling. Your environment plays a huge part in your productivity. Back in your own zip code, you likely set up your office in a specific way to maximize efficiency. You put everything you need at your fingertips, from your coffee pot to your stapler and sticky notes. While traveling you generally have four different offices: the airport, the plane, your hotel room, and the host office. In each of these locations, create an environment that best supports your productivity. Everyone is unique in how they work best. Some people require noise to work in their zone of focus while others need absolute silence. Some prefer the busyness of a bustling coffee shop. Others desire a plain, white-walled room so they don’t get distracted. Find what works best for you and strive to create that environment in each of your “offices.” That could mean listening to rock music on your iPod and parking yourself next to a bustling aisle or tucking yourself away in an isolated corner with noise-canceling headphones. Anything can happen when you travel. You may even find that Murphy becomes your unwelcome travel companion. Your laptop could get stolen, dropped, or broken. You could leave it under your seat in the airplane and not realize it until you arrive at your hotel. Don’t risk losing your important work by failing to plan. Before leaving for your trip, back up and send up all your electronic files and make them accessible in the Cloud. When you count on the Cloud, you’re not only preventing the loss or destruction of your documents, you’re creating the ability to access them via an online storage app at anytime, anywhere, from any device. There are few things as frustrating as having a great block of uninterrupted time in which you can work, opening your bag, and finding out you didn’t pack the thumb drive you needed. Or your computer battery is dead. Or you’re missing the contract you were going to go through with a fine-toothed comb. Don’t waste time and mental energy trying to remember everything you should do or pack before leaving. Create an electronic checklist that can easily be printed to adequately prepare for every trip. Use your previous travel experiences to guarantee nothing is forgotten. Add any missed items to your master checklist so they will not be overlooked next time. If you’re traveling with or visiting other people, what you do with your time affects them. Therefore, you must articulate your boundaries to everyone. Let them know when you have planned work time versus free time, clearly explaining that you’ll be unavailable during certain times. Setting boundaries is important to get the space you need to keep moving your business forward, minimize your stress, enjoy your trip, and help others enjoy theirs instead of being disappointed. By sharing your itinerary with others, you’re giving them permission to do whatever they want while you work because you have no expectations of them during those time blocks. You may tend to approach trips over-ambitiously, with lofty goals of how much you can accomplish during your “free” time. Whether you’re traveling mostly for business or mostly for pleasure, you want to enjoy your trip. Therefore, set realistic expectations for how much work you can get done. If you find free time to read a business book, great, but don’t set a goal to read five books. You’d be preoccupied trying to accomplish that goal instead of being present in your destination. If there’s one thing you should know about traveling, it’s to expect the unexpected. Between delayed flights, lost luggage, bad weather, food born illnesses, and injuries, so much could go wrong that is out of your control. Don’t leave what you do have control over to chance. Plan strategically so you can get focused work done in any time zone and keep your business moving forward.